The Department of Pediatric Neurology at the University Hospital of Ludwig Maximilian University of Munich offers the full range of diagnostics and treatment of all acute and chronic diseases of the nervous system in children. The department is headed by Prof. Dr. med. Florian Heinen. To provide a comprehensive medical care and optimal results, all the necessary specialists are involved, namely pediatric neurologists, psychologists, physiotherapists, occupational therapists, speech therapists. Depending on the complexity of the clinical situation, either outpatient or inpatient treatment may be offered. The department has all advanced diagnostic and treatment methods. Also, much attention is paid to the moral support of young patients and their parents. Director of the Center for Social Pediatrics (iSPZ). Medical Specialist in Pediatrics and Adolescent Medicine. 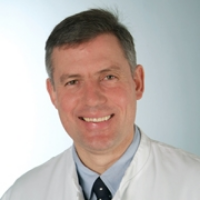 Head of the Department of Pediatric Neurology at the University Hospital of Ludwig Maximilian University of Munich. Cerebral palsy, dystonia and other motor disorders.